Earth Day was yesterday, but your social media feed is probably still full of posts from companies promoting their “green” efforts. But how many of them actually follow through with their lofty CSR promises? We break down CSR campaigns and the companies that are working to make a difference in an authentic way. This APR Month, Three Box Principal & Founder Blake Lewis, APR, Fellow PRSA, shares his thoughts on the value of becoming Accredited in Public Relations and how the credential sets the bar for industry standards and best practices. CEO Activism: Is it time to speak up? CEO activism is on the rise, according to numerous studies, and consumers are taking notice - in a positive way. Three Box analyzes a few key principles for CEOs to consider BEFORE they choose to speak out on a hot-button issue. Three Box CEO Amanda Hill has been invited to join the Forbes Dallas Business Council, an invitation-only community for Greater Dallas business owners and leaders. 2017 has come and gone, but we don’t want to forget about some of the biggest PR wins of the past year. Here are a few of our most memorable examples of great PR, marketing and communications. When it comes to Net Neutrality, entrepreneurs, innovators and consumers need to join me in sending a loud, long and strong message to politicians, particularly those on the right side of the Congressional aisle. Public relations internships play an important role in the education and development of aspiring PR professionals. However, at Three Box, we believe even more in the power of mentorship. Our principal and former intern team up to share their perspectives on why mentorship is valuable to both young professionals and the agency. A couple of weeks ago, we announced that Ashton Brown joined our team as an associate. Now that she’s been here for a month, we thought it would be nice for everyone to get to know her a little better through our "Meet LPR" series. Co-branding is a powerful way to reach new customers and build brand loyalty, and it’s a force to be reckoned with in the marketing world right now. Brands are teaming up more than ever before to take advantage of this win-win strategy that’s designed to boost sales and awareness for everyone involved. When a client asks for a creative idea or strategy, our team gets giddy to put our heads together and lay ideas on the table during a brainstorming session. Brainstorms: where creative juices flow freely and no idea is a bad idea – but that doesn’t mean your brainstorming sessions can’t be structured. Three top-notch communications firms, two in the U.S. and one in China, were welcomed as full members of the Public Relations Global Network (PRGN) at the spring conference of the one of the world’s largest networks of public relations agencies on Thursday, April 29, 2016, in Washington, D.C.
An interesting article recently came out at CIO Dashboard, entitled “Who’s in Charge of Digital?” The world often presents dramatic business changes that cause questions about C-suite roles and responsibilities. But I'd caution leaders to pay close attention when changes are proposed to executive designations. At LPR, we believe that accreditation sets a public relations professional apart in a sea of party planners, publicists and purely strategic players. Accredited in Public Relations, or APR, is the public relations credentialing process that validates a professional's strategic thinking, understanding of emerging techniques and commitment to ethical practice. Last week, a few members of the Lewis Public Relations team got the inside scoop about what has been happening at The Dallas Morning News straight from Editor Mike Wilson. The first outside editor for The Dallas Morning News in 35 years, Wilson’s résumé boasts 30 years in print and journalism, which he is drawing on to make some big changes at the organization. Lewis Public Relations works with media professionals every day, and we value the relationships we’ve built along the way. In today’s “Meet the Media,” I’d like to introduce you to Jessica Golden, a field producer covering sports business at CNBC. Jessica and I worked together on piece featuring Topgolf at last month’s PGA Merchandise Show in Orlando. The Wall Street Journal is now publishing stories on Snapchat and it’s safe to say Snapchat has officially earned a seat at the social media VIP table. The pairing of an established and prestigious newspaper with an app primarily used by millennials is a win for both parties. For the Journal, it’s an avenue to reach and retain young readers. For Snapchat, whose users are mostly young people, the addition of the Journal may appeal to an older audience and attract new advertisers. Yep, the White House joined Snapchat just in time for the President’s State of the Union address last month. This isn’t the first time the Obama administration has taken strides in the social media world – President Obama is the first sitting president to have his own Twitter account and Facebook page. Obama’s director of product management said the White House was joining Snapchat to reach the growing percentage of the population that uses the app to consume news and share with friends. I bet Snapchat was pretty pleased to hear the White House thinks the app is 1) big enough to reach the national audience and 2) a legit news outlet for something as prestigious as the SOTU. Snapchat has offered geofilters – geographically restricted graphics that can be added to a user’s photo or video – for a while. However, it just introduced a new geofilter option that will allow anyone, even smaller companies, to submit temporary geofilters for a party or an event for a $5 fee. The company currently receives floods of “on-demand” geofilter submissions, but Snapchat hopes the fee will slow the pipeline to a more manageable number of submissions. As Snapchat continues to grow, this is a huge innovative step in terms of both revenue and user retention. Whether you’re a fan of Snapchat or not, you can’t deny the company’s ingenuity and strategy. The app is constantly searching for ways to reach a broader target market AND create new channels of revenue. Earlier this month, PRSA Dallas hosted Martin Waxman, APR to speak at a well-attended social media workshop. He provided strategic insight that was easy to both understand and implement, but I was particularly interested in the concept of “PR by the micro-moment.” Google describes micro-moments as “a critical opportunity for brands to shape our decisions and preferences.” Where are we turning to in these moments? Presumably, our iPhones. During the discussion, Waxman referenced an interesting article by Scientific American on how the Internet is beginning to replace a friend or family member as a companion in sharing the daily tasks of remembering things. Because of our dependence on mobile devices, we are increasingly turning to Google or Siri to give us the answer we want NOW. 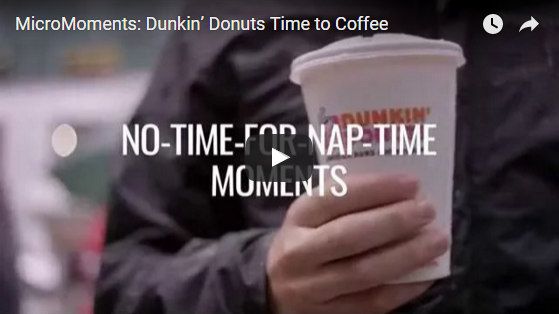 Watch this Think Google video on how Dunkin ' Donuts is engaging in the micro-moment. What does this mean for marketing and public relations? Everything has changed. Waxman posits brands are looking at audiences the wrong way. Throw demographics out the window and instead understand that the immediate need of a consumer supersedes any brand loyalty. The Home Depot shifted DIY focus to women with Do-it-Herself workshops and tutorials. First, you need to be there when the customers arrive in these micro-moments. This means creating a web presence that straddles search engines, social media networks and wherever else your audience may be lurking. Brand strategy also needs to incorporate more than just mere presence to win over a potential customer. The content available needs to be useful to the consumer. The information needs to be offered clearly and in an easily digestible way. Think DIY videos or short, practical case studies—whatever best meets their need. Finally, the strategy needs to incorporate a real-time component. How many times have you closed an Internet tab or exited an app because the load time took too long? Work to create a desire path making the user experience seamless and quick. Micro-moments are completely changing the game and the opportunity is palpable. Whether you’re working with a corner store or Coca-Cola, shifting your focus to enhancing the consumer journey through these micro-moments will surely elevate your marketing success.